A very special opportunity exists to legally distribute the Word of God to remote and rural parts of East Asia. Locally printed to the highest quality with National Government approval, tens of thousands of Bibles have been individually given out through partnership with registered Church leaders, verified one by one into the hands of Church members. Such is the current growth in membership and new believers in China that requests to assist with Bible placement are increasing month by month. Generous donors have committed matching funding towards the printing costs. You can travel with a verification team to participate in a distribution and be blessed as you place God's Word into the hands of those who cannot readily obtain or afford to purchase their own copies! The Church in East Asia is growing at a phenomenal pace. New believers need their own Bible to grow in the faith. Teachers in Churches and Meeting Points week by week need tools and resources to feed their congregations. Experienced elders, pastors and teachers are in short supply in rural locations. Many newly trained Bible teachers are placed in rural locations many miles from their senior mentors, and have the weight of responsibility of leading growing Churches, often without study tools that are beyond their financial reach. Can you imagine a Western pastor preparing sermons without access to a good Concordance, Dictionary or Commentary? Providing Study packs to recently qualified pastors and teachers can have a multiplication effect - these individuals will be the future leaders of the Church and you can help them for many years with a one-time gift. On a recent trip to China with GB4A, our non-executive President, Rev. 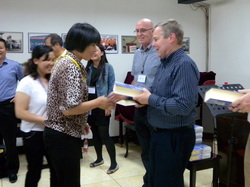 Stephen Gaukroger, presented 50 Chinese Study Bibles to key pastors and senior leaders from a major inland Chinese province. He commented "This teaching and training trip confirmed to me the huge new reality of the Church in China today. It is encouraging and challenging to see such passion for the Word of God and the opportunities that currently exist to work with key leaders in the Registered Church." Why not pray about joining one of our upcoming distributions - it will be a rewarding and life changing experience! If you cannot come with us, please consider helping fund further training conferences for pastors and leaders.